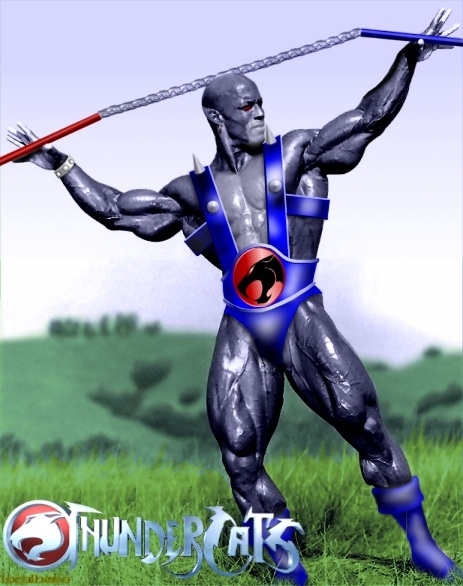 Body builder Shawn Ray as Panthro, seen here practising his martial arts. For Thundercats theme day. The base pic was black and white. first thing i did was give it a blue/grey colour tone. The grass at his feet was coloured using a gold multiply layer at 50% transparency. this and the hills behind were then coloured uisng a green multiply layer at 50% transparency. The trees and bushes behind were done shaded using vrious greens to give them more volume. also added some brown for trunks, this was all softened to give a hazy distant feel. The sky was done using a gradient fill, over the top part. The shape of the figure was then cut out from all these layers to return him to his blue/grey colour. A lighter shade of the grey/blue was used on the chin and chest via a “screen” layer. the edges were softened and blended to the body colour. basic blue shapes were drawn over the figure to create the costume elements. these were shaded and highlighted by blending black and white layers over the top. the belt was done by using a metallic gradient fill on the lines at the top and bottom. the logo was drawn using the vector drawing tool then resized and rotated to fit the body angle.